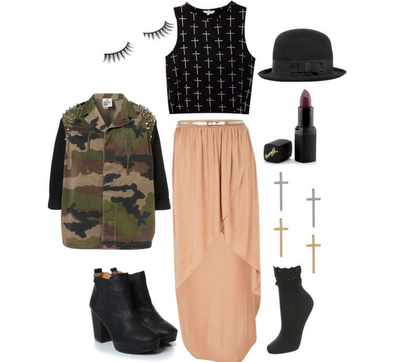 I always look to Polyvore sets for outfit inspiration, I love the way you can type in a person/band/era and it will bring up complete outfits, which always give me new ideas of how to style items of clothing. It was only a matter of time before I started making them myself and although this is only my second set I think it represents my own style pretty well and fits with the current grunge trend which I am loving. I have really long eyelashes so my eyes are always the focus of my make up but I always love to wear lipstick and find dark purple really flattering, I know i'll be wearing it non stop during A/W! I have also been looking for a good camo jacket for a while and recently found a great one in Primark of all places which was a surprise! As for the rest of the items they are all things I would wear, especially the heeled chelsea boots, I just haven't found the perfect pair yet! If you like any of the items then check out my polyvore page here, everything is high street too so there won't be any disappointment like when you find out the socks are £100!